One of the key questions in human evolution is when and how our early ancestors migrated out of Africa. Now, a remarkable discovery of stone tools embedded in an ancient coral reef points to an answer. “Call it the world’s first oyster bar,” says Canadian geologist Bob Walter. He’s head of an international team that made the discovery in Eritrea. On the Red Sea coast in the Gulf of Zula, the team woke up one morning last January to find that they had camped on the surface of a 125,000-year-old coral reef, now six metres above sea level. Mireille Guillaume, a marine biologist at the Museum of Natural History in Paris, discovered the fact during her morning ‘ablutions’, laughs Henrich Bruggeman, a marine biologist at the University of Asmara, Eritrea and her husband. Why is a coral reef above sea level? It seems odd to see a coral reef above the ground, but the reason for it is simple – ancient climate change. During ice ages, much of the Earth’s oceans are locked up in the polar ice cap, causing sea levels to drop dramatically. In fact, says Dr. Bob Walter, a geologist at the University of Toronto, during the last two glacial periods, roughly 150,000 and 20,000 years ago, sea levels dropped as much as 130 metres below the current levels! However, during interglacial periods, like the one we are experiencing now, the sea levels rise again. 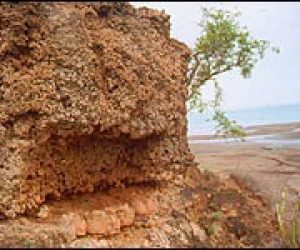 Walter believes that the tool-rich coral reef in Eritrea was formed during our last interglacial period about 125,000 years ago, when sea levels would have been about six metres higher than they are today. But what they found embedded in the coral reef was no joke. Fossil clams, scallops, oysters and crabs. And two types of stone tools! They are the earliest evidence of humans living near a marine environment – perhaps where our ancestors first learned to eat seafood. “We think that whoever was using these tools was using them to harvest marine food resources, like crabs, clams, oysters,” says Walter. 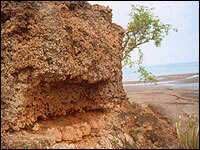 In the rocks of the former beach near the coral reef, the team also found fossils of elephants, hippos and rhinoceros. All together, they paint a picture of what life was like 125,000 years ago. Evidence of the seashore human settlement suggests that the Red Sea coast was the migration route taken by our early ancestors to enter the Near East and into the Old World. The fossil record shows that anatomically modern humans left Africa about 100,000 years ago – just 25,000 years after they lived on the coast of Africa. “Once early humans adapted to this environment, it would have been natural for them – over many generations – to expand their presence along the coast,” explains Walter. But while the find provides a possible answer to the key question of when and how we migrated out of Africa, it also raises a lot of other intriguing questions. The team found two main types of stone tools. “We’re finding these acheulean hand axes again, which is very interesting because it’s very, very young to find them. Most people had thought that the industry had died out by 300,000 to 200,000 years ago,” says Walter. The team also found an abundance of obsidian tools, which are tools made from volcanic glass. “They were really fresh, not eroded by weather and wind and so on,” describes Bruggeman. But as Chazan explains, obsidian tools are usually associated with much later periods, and most commonly used with the origins of agriculture about 7,000 or 6,000 BC. Perhaps even more surprises await in northeast African country of Eritrea, which is turning out to be a treasure trove of ancient relics. The team is only in the middle of this scientific exploration. “As research here continues, I believe Eritrea will yield many more secrets about how modern humans evolved and migrated out of Africa,” says Walter.